Water. We know that it is a vital part of our health and wellbeing. Doctors and experts have been telling us for decades. You probably already knew that adequate hydration promotes optimal organ function, good digestion, healthier skin, and even encourages a healthy weight, but did you know it is also vital for good spine health? Just as the rest of your body needs water to function properly, so does your spine. When you don’t drink enough water, and become dehydrated (even mildly) it can create problems, some of them painful. If you want good spinal health, you have to stay well hydrated. This is because of the way the spine is constructed. Dehydration can lead to pain, poor mobility, limited range of motion, and decreased flexibility. Your spine will age much faster and this can have a ripple effect throughout the body. The spine is the foundation for the body and provides the pathway for neural impulses. When it isn’t working, most of the body isn’t working. In order to understand why water and good hydration play such an important role in spinal health, you first need to understand how the spine is constructed and how it uses the water. 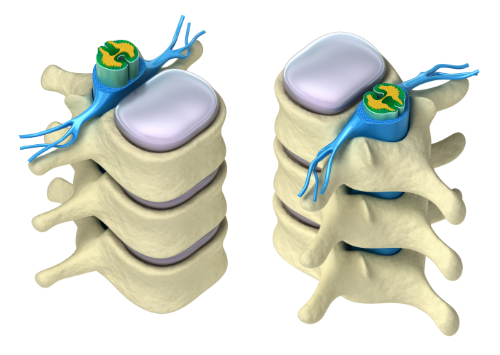 The spine is a column, made of vertebrae that are connected to each other by small joints. Between each vertebra is a fluid filled disc. This disc cushions each vertebra so the bones don’t rub against each other, especially when moving or bending. It also acts somewhat like a shock absorber to that the spine does not take the full impact of movement which could cause damage. Each disc is comprised of two parts. The center, called the nucleus pulposis, is filled with fluid. This is what protects the bones. The tough, outer ring is flexible, but strong, protecting the disc. The ring is filled with a sort of gel but the disc itself is made up of water. If there is not enough water in the disc it cannot cushion the bone properly and this can lead to spinal problems. It can be very painful. This is what makes hydration so important. As a person ages the discs don’t rehydrate as easily so it is particularly important for older people to drink lots of water. A sedentary lifestyle can also exacerbate the problem, making it more difficult to rehydrate the discs. As soon as you get out of bed in the morning, gravity starts working against your spine. Whether you are sitting or standing – and as you move about – you are putting pressure on it, causing the vertebrae to compress the discs. This squeezes the water out. If the water it not replenished, you could find yourself with some painful spinal problems. Drinking lots of water throughout the day helps to keep your body hydrated. A body that is well hydrated can replenish the water that was lost in the discs. The thing is, you don’t have to be completely dehydrated to feel the ill effects. Even being slightly dehydrated can begin to cause problems. If the dehydration is prolonged, those problems can become serious. It is important that you drink water as opposed to sodas. Aside from the sodium, sugars, and unidentifiable chemicals that you put into your body every time you drink one, sodas do not provide enough water to your body to be useful. You need to go for plain water. If you don’t like water, there are ways you can flavor it without spending a lot or using ingredients like aspartame. Cut a lemon, lime, or orange and let it sit in the water to infuse. Mint is also nice, but you can also slice some strawberries and put them in a pitcher of water for a refreshing, fruity drink. So, drink your water. Your spine will thank you. Our FREE Health & Wellness Updates!